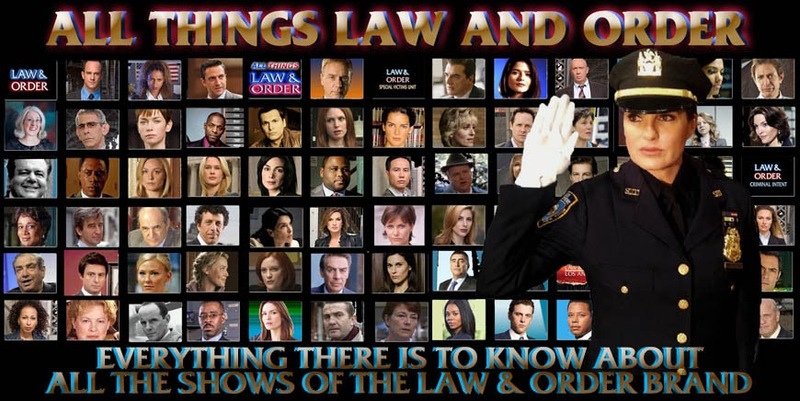 Law & Order UK “Mortal” was based on the original Law & Order episode “Golden Years” (season 4, episode 11). “Mortal” was a well written episode that presented an interesting case of an old woman who appears to have died at the hands of her granddaughter who was presumably starving her to death. The granddaughter was having financial difficulties and her grandmother’s death would mean a windfall and a solution to her money problems. 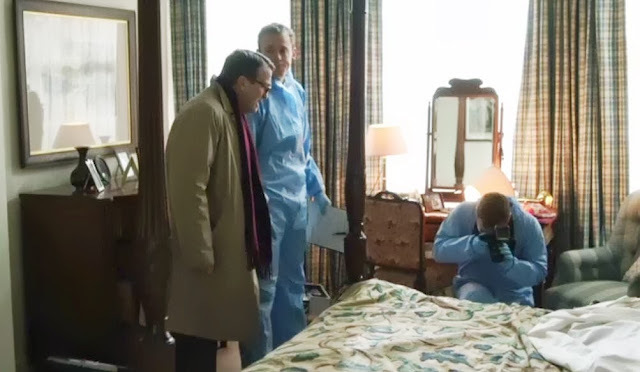 But it quickly becomes clear that what looks like murder is not going to be an easy case to prove for Jake Thorne. On top of this, Jake seems to be suffering from a guilty conscience regarding his own mother’s illness and death. Kate Barker thinks he's taken action against Connie Moran because of his own guilt, and later Jake realizes maybe it did have influence. But, did Jake cut Connie too much slack for the same reason - his own guilt? 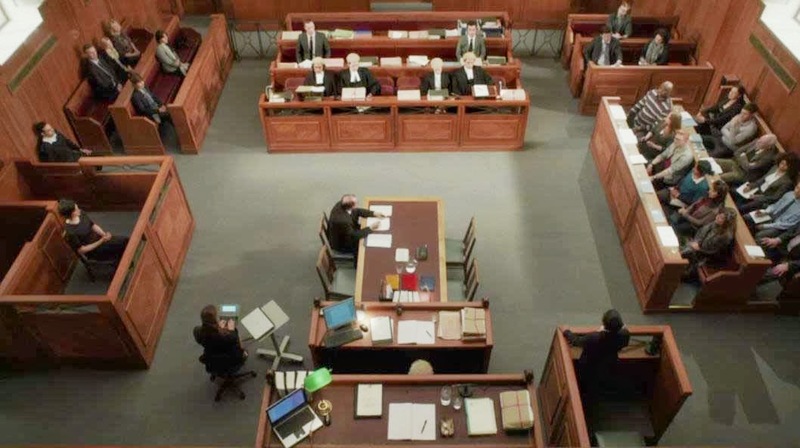 This was one of those cases where, despite the verdict of not guilty, I still wonder if Connie DID help to accelerate her grandmother’s death. Yes, the jury got the correct verdict, but that doesn’t mean that Connie Moran was innocent. Jake made a compelling argument that there were just too many lies and convenient coincidences. Sadly, Jake lacked the glue that held the whole case together – hard evidence. An elderly woman, trying to catch her cat who has run off in the building, enters her elderly friend Jenny Moran’s flat to find it ransacked and Jenny dead on the floor next to her bed. Later, DS Ronnie Brooks is on the scene, along with the forensics team, to find Jenny is heavily bruised from either a beating or a fall. 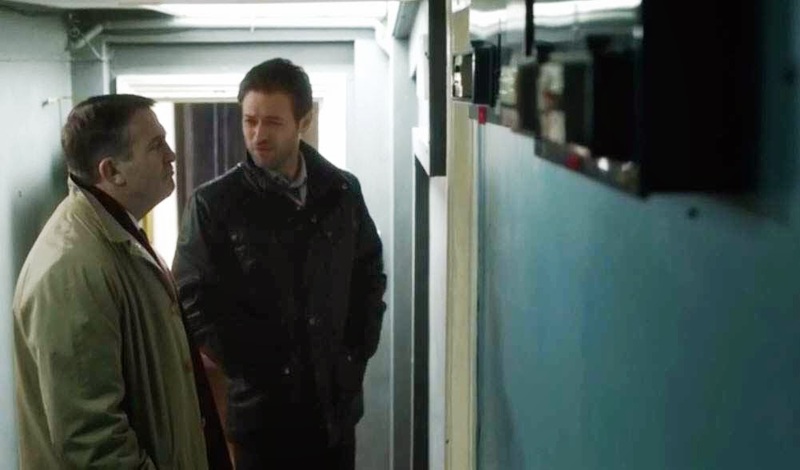 Ronnie speaks with the neighbor, Harriet Pelham who explains her cat Ignatius who went into Jenny’s flat. She didn’t see anyone but realizes someone took Jenny’s silver carriage clock that used to be on the mantle next to the Virgin Mary. Ronnie goes into the other room and look at the mantle with no clock, and wonders if all this was for a clock. He picks up the statue of the Virgin Mary and says it’s Mater Dolorosa – Our Lady of Sorrows. At the morgue, Ronnie and DS Sam Casey speak with Lilly who explains there were no signs of trauma on Jenny’s body, and no evidence of violence at all. She adds that Jenny’s not eating did not help, and she had hypertension, diminished organs, kidney failure, dehydration and loss of adipose tissue, plus low levels of insulin and her glycogen was through the roof – she knows how she ended up, just not how. 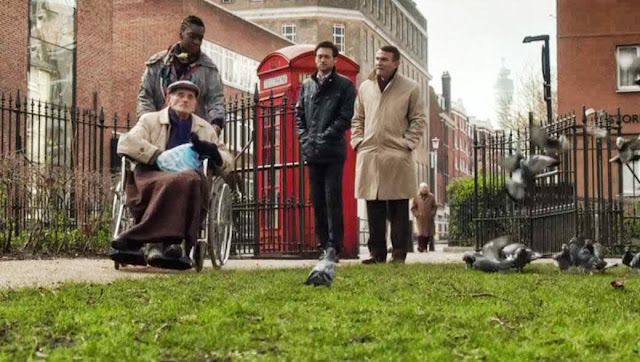 At M.I.U., Ronnie and Sam speak with DI Wes Leyton, explaining they don’t know how Jenny died. Sam says she died about 12 hours before she was found. The only thing missing so far is the silver carriage clock. The neighbor’s cat seems to be the only witness. Wes speculates it was a robbery and she interrupted them, and Ronnie explains her poor physical condition. Angela enters and explains that the next of kin are in the family room and Wes suggests Ronnie handle it and that Sam should check with the usual suspects – pawn shops and fences – for the clock. Ronnie speaks with Jenny’s daughter in law Caroline and granddaughter Connie. Connie had the most contact with Jenny, and Jenny did not want to leave her home to move elsewhere. Connie explains that Cecile Bakama lived with the grandmother for the last 6 months as a caregiver. Ronnie explains there was no sign of anyone living there, and Connie explains when she was there Tuesday Cecile was there playing Boggle with Jenny. Ronnie asks where she got Cecile from. Later, Ronnie tells Wes that he spoke to the agency and Cecile arrived in England from the Congo 3 years ago and she had a good record. Ronnie adds the agency said Cecile went back to the Congo 2 months ago as her visa expired. Wes suspects that Cecile told the agency she was going home but instead stayed with Jenny and asks Ronnie if he suspects things went wrong with Cecile. Ronnie adds that the agency said another Congolese girl joined the agency around the same time as Cecile and she may know where Cecile lives. On Smithson Street who speak with Cecile’s friend who explains Jenny was always sick but it never stopped her from going to mass and Cecile is the same. She doesn’t know the name of the church but says Cecile is the one who needs forgiveness as she is a thief. She explains that Cecile stole her boyfriend, Olivier Dando, and they can find her in his flat and there aren’t enough Hail Marys in the world for what she’s done. At the home of Olivier Dando, Ronnie and Sam attempt to see Cecile but Olivier feigns not being able to speak English. When Ronnie speaks to Olivier in French, Cecile, standing in the room, tells Olivier it is okay. They tell her Jenny is dead and when Sam asks if they can come in, Olivier asks in English if they have a warrant and when Ronnie and Sam try to talk they way in, Olivier says no warrant, no looking, and tries to shut the door on them. Sam stops him and ask Cecile why she wasn’t at Jenny’s the day she died. Cecile explains she was fired by Connie. Olivier says that is enough and slams the door. At the home of Connie Moran, Connie says she didn’t fire Cecile, and then wonders if Cecile killed her grandmother. Connie said things did go missing from the flat but it wasn’t worth it to fire her because her grandmother was doubly incontinent and it wasn’t like they had caregivers lining up down the street. She didn’t mention this before because the person broke in and Cecile had keys. Back at M.I.U., Wes comments that Connie has a point – unless Cecile was covering herself pretending it was a break in. Ronnie does not think Cecile is that clever, but Olivia has previous convictions for burglary and a robbery charge that was later dropped. Wes speculates Olivia got the keys and it was payback for Cecile’s firing, but Ronnie reminds him Connie says she did not fire her. He tells Ronnie to go back to Olivier’s and this time with a warrant, and Angela walks up and says they may not need to, the clock has been found. Later, Ronnie has Cecile in interrogation with her brief, explaining that a pawn broker told them a couple had been in to pawn a silver carriage clock. He identified Olivier from a photo and gave a good description of Cecile. The brief says his client explained that Jenny gave it to her, and Ronnie comments that she pawned a present. Cecile tries to talk but the brief cuts her off. Ronnie continues to press the issue and Cecile says Olivier didn’t do anything, he only broke down the door. She explains that they knocked and there was no answer and she told him to kick in the door and they found Jenny on the floor. Ronnie asks about the flat being ransacked, and Cecile explains she was looking for her pills, but her pills weren’t where they should have been. But it didn’t matter, Jenny was already dead. She did not call 999 as she did not want to be send home, she needs to earn money to send home what she can, and this is why she pawned the clock. She claims she gave the keys to Connie when she was fired. She only went back because she was worried about Jenny – she was fired because Connie caught her giving extra food and water to Jenny. Connie told her not to, and at first, she tried to do what Connie asked but the amounts got smaller and smaller and Jenny was so thin. It broke her heart. The brief hands to Ronnie instructions from Connie which explains how much food and water to give to Jenny and when. Ronnie sees that on Monday it was a small glass of water and Monday a half of a potato. The brief calls Connie’s instructions a how-to on starving her grandmother to death. Afterwards, Ronnie explains this to a stunned Wes. Wes asks if they can prove Connie wrote this, and Ronnie says Olivier’s MO is about waving crowbars about, not withholding carrots. 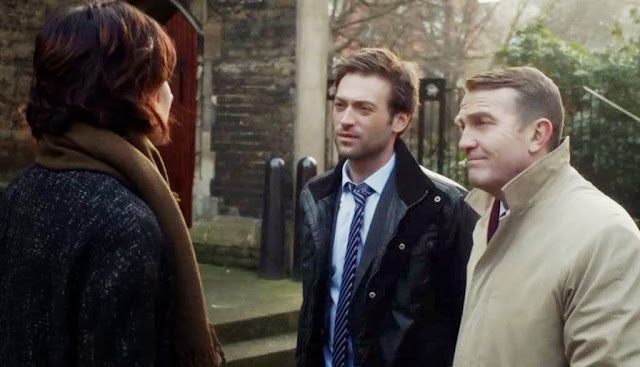 Later, Ronnie and Sam wait outside the church and meet up with Connie who is there trying to arrange Jenny’s funeral. They asks her about Jenny’s food intake, and that Jenny starved to death. Sam shows her the instructions they got from Cecile, and Connie admits that she had to write it out as Cecile did not get it. Jenny’s kidneys were a problem and her liquids had to be restricted and she was just doing what she was told. Sam asks by who? Ronnie and Sam speak with Dr. Hastings who explains that Jenny was in chronic renal failure along with a host of other ailments. He did tell Connie to monitor Jenny’s water, salt, potassium intake and he has no idea if it helped. Jenny changed consultants 6 months ago. His office got a phone call saying she would not be coming in any more, and when Sam asks if Jenny made the call, Dr. Hastings explains that her granddaughter did. 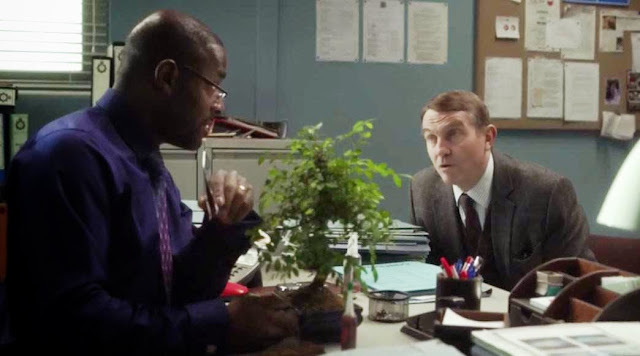 Later, while Wes tends to his bonsai tree, Ronnie explains what the doctor said but that the feeding instructions were Connie’s work, it was the first he’d heard about them, Ronnie adds that Connie said she was going to change Jenny’s doctor but no one has requested Jenny’s medical records. Wes thinks there are easier ways to kill someone, but Ronnie counters that there are not crueler ones. Wes asks about Connie’s motive, and Ronnie replies she is the only next of kin. Wes wonders if maybe there is a will, and Ronnie adds that where there is a will – and Wes finishes there is a relative. At the courtrooms, Ronnie and Sam speak with Jonathan Norton who has been Jenny’s solicitor for years. She had little money which she left to charity. She left a few items of jewelry to Connie, nothing of great value, but Connie did have Jenny’s flat. Back at M.I.U., Angela informs Ronnie that according to the land registry, Jenny owned the flat outright but two months ago, Connie was made joint tenant. When Jenny died, Connie became sole owner and has just taken out a mortgage against it. Sam explains that 18 months ago, Connie was a witness to a car crash, and when she gave a statement she gave her occupation as a company director of Mogo Life Software. In the last two months they have been given three wind up orders. Ronnie comments that she is going bankrupt, but Sam counters not any more, all three creditors have just withdrawn their orders. Ronnie comments that someone has been paying the bills. At the office of Mogo Life, Ronnie hears from Darren that Connie paid off all the creditors, and Ronnie said it was just lucky that her grandmother left the money just when they needed it. Darren explains that Thursday night Connie insisted they stop by just to check on her grandmother because she was worried, and Ronnie replies that Thursday night is the night before her grandmother was found dead. Ronnie questions if Darren went up to the flat with Connie, and he said no, it was only 15 minutes and Connie said Jenny was sleeping. He said all Connie thought about was her gran. At M.I.U., Kate Barker speaks with Wes and says there is no weapon and no proof. Wes counters that Connie did say that the last time she was in the flat was 3 days before Jenny died but they know she was in the flat the day before. Her grandmother was still alive and she did nothing to help her, and Kate interrupts that is conjecture. Wes goes on to say that Connie went to a meeting with her creditor and promised them they would get paid, a promise she now knew she could keep. Kate counters that they only have the carer’s word she was fired and they can’t prove Cecile and her boyfriend didn’t finish her off when they broke in. Wes says Connie starved her grandmother to death so she could get her hands on the flat and save her company. Kate replies it is death by omission, but Wes says it is murder. Afterwards, Ronnie and Sam wait for Connie as she exits the church after services, and arrest her for murder. At CPS, Jenny’s brief Vijay Prasad speak with Jake Thorne and Kate, and Jake comments about all of Jenny’s lies and they all debate what caused Jenny’s death. Jake reminds Vijay that starvation is a weapon, and Kate adds that Connie ended up with her grandmother’s flat. Vijay counters that is because Jenny was her grandmother. Vijay says it is not that they don’t have a case, they don’t have a crime, but if they want to prove omission, be his guest. They also have to prove Jenny would not have died anyway. Kate states that Connie accelerated Jenny’s death, and Vijay counters that Jenny was dying and there are a string of doctors who will swear that the malnutrition was incidental. If the experts can’t agree as to the cause of death, how can they expect a jury to? Later, Jake and Kate confer with CPS Director Henry Sharpe who says Vijay was always going to argue causation to muddy the waters, and asks if Jake is ready for him. Jake says Connie was responsible for her grandmother’s death, and what she did doesn’t have to be the sole or main cause, merely a substantial one. 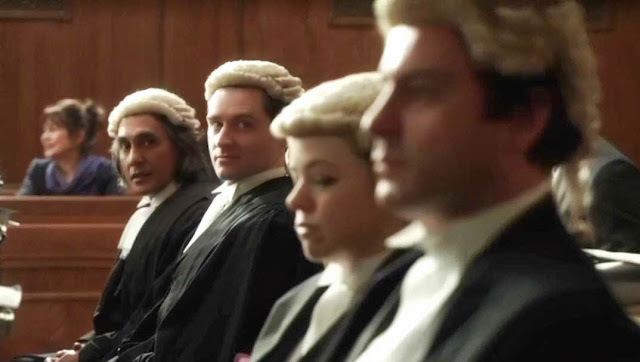 Henry reminds him it has to be beyond a reasonable doubt which the jury will have to be sure of to convict. Jake replies that she might as well have given the old lady an injection, but Kate says it is not the same. Jake thinks it is, Connie was Jenny’s de facto custodian. 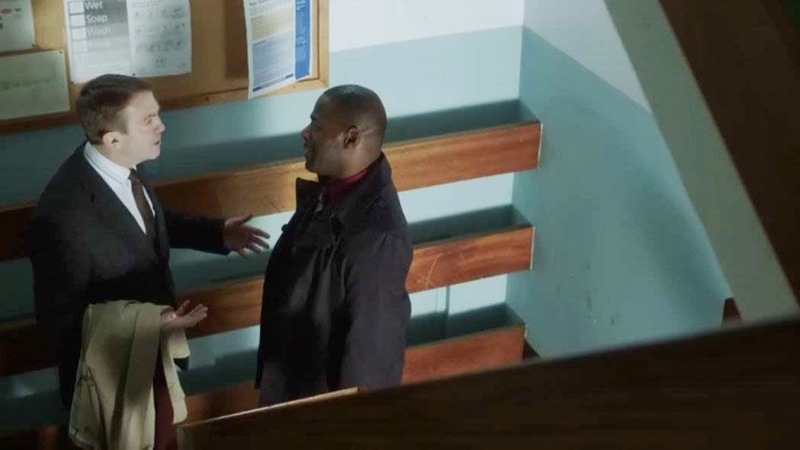 Henry asks if she had a duty of care, and Jake replies that Connie’s action killed the person she claimed to be responsible for. Henry says then get her on gross negligence manslaughter. Kate counters that Vijay will argue that Connie was exercising that duty – and Jake questions by starving her? Kate replies it is by following doctor’s orders, and that you can only argue duty of care if Jenny was mentally incapable of looking after herself . Henry suggests that they find out. At Connie’s home, Ronnie and Sam speak with Caroline Moran about Jenny’s mind was fine, it was her body that was the problem. She thinks they are trying to show that Connie tricked Jenny and once she got her hands on the flat…she says Connie loved Jenny and after Connie’s dad died, whatever love Jenny had she gave to Connie. Jenny knew exactly what she was doing when she made Connie joint tenant. 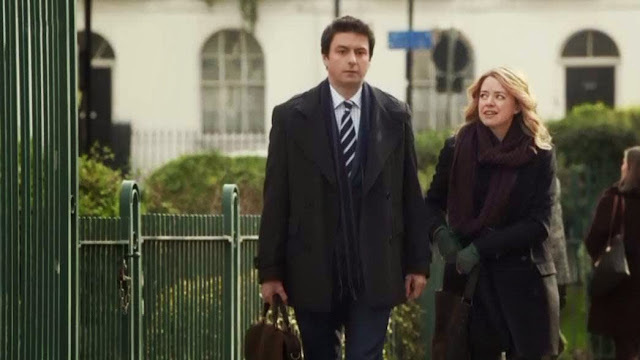 Meanwhile, walking outside, Kate gets off the phone and tells Jake that Caroline will swear her mother in law was competent and they can’t argue duty of care. Jake says that leaves them with murder which is find, because that’s what it is. Kate brings up no proof or physical evidence, and Jake explains there never was. He says no more games and no more maneuvering, they trust the system. A helpless old woman starved to death in cold blood and they go in there and put it in front of a jury and let them decide. At Crown V Moran, Vijay questions Lilly about the all of Jenny’s ailments which all contributed to Jenny’s arrhythmia and to her loss of appetite, and she must admit that the malnutrition may have been a result of all her ailments. Dr. Hastings testifies about Jenny’s dietary requirements after being diagnosed with chronic renal failure but had no knowledge about the diet that Connie was using. He also was bothered that Jenny was not seeing another doctor, saying it was foolish and dangerous, and that Jenny needed expert care. Under cross examination, Vijay presses Hastings on his CRF diagnosis and why it took so long to diagnose. Hasting says it is a long term issue, but Vijay says a chronic condition can get worse if undiagnosed. He brings out old notes when Hastings first saw Jenny and that she had little or no appetite, had vomiting, fatigue, and swollen ankles, the latter caused by fluid retention. Vijay states that Jenny was already in stage 4 renal failure and Hastings was so late in diagnosing it the damage had been done. Vijay goes on to say that Connie switched doctors because she did not trust Hastings, and she wanted to keep her grandmother alive. Vijay asks in what way dangerous, in regards to Connie taking Jenny away from Hastings’ care, and when Vijay rattles Hastings, Hasting admits renal failure is a killer. Jake and Kate look less than thrilled. 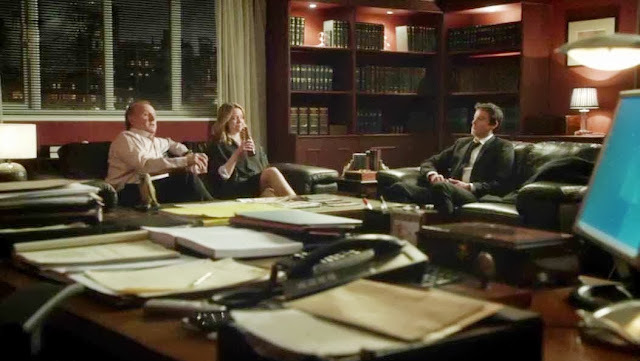 Later, at CPS in Henry’s office, Kate worried that Vijay will have the jury doubting their own names. Henry says he knew that was going to happen the minute they decided it was murder. Henry wonders why Connie didn’t just hold a pillow over her grandmother’s face, and Jake says he does not know or need to know, Henry brings up the notes Connie gave to Cecile, and Jake argues maybe Connie wasn’t thinking and was more interested in getting her hands on the flat and pay her bills. Henry’s phone rings and as he gets up to answer it, Kate asks Jake why he hates Connie so much. Jake insists he doesn’t, adding Connie was the only real family Jenny had instead of taking care of her, she left her to die and things like that you have to pay for. Kate looks closely at Jake and says instead of taking care of her, she left her to die, and Jake says that’s right. Kate leans forward and tells Jake he can’t make up for his mom by punishing Connie Moran. He stares at her and tells her to go home, get some rest, she has the neighbor in the morning. He gets up to leave. At Crown V Moran, Harriet testifies that Jenny loved to give things to Connie. She mentions that Cecile stopped her from seeing Jenny on Connie’s orders, Vijay questions her about why she could not see Jenny and brings out that Jenny was being taken advantage by many people and that Harriet borrowed money from Jenny which she had not paid back. Vijay thinks Connie knew Harriet could not be trusted. Jake and Kate again look less than thrilled. Afterwards, in the hall, Harriet tells Kate she was supposed to leap up and object, she’s seen it, and that man made her look like a criminal. Kate replies it would have helped if Harriet mentioned the money when she was first interviewed. Harriet counters that she did not think it was relevant. Kate asks how about now? Harriet snaps back for Kate not to get shirty with her just because Kate didn’t do her job, and that one day Kate will get old too and invisible, your whole life in a heartbeat. Harriet walks off. Jake calls out to Kate apologizes for not seeing Vijay coming. Jake tells her to forget it, but she thinks he will try something similar with Cecile in the afternoon. Jake replies he doubts that, Cecile is being departed today. Back at CPS, Cecile’s brief is there with Cecile trying to cut a deal to get Cecile to be allowed to stay. Jake is trying to delay deportation but the brief wants them canceled altogether. 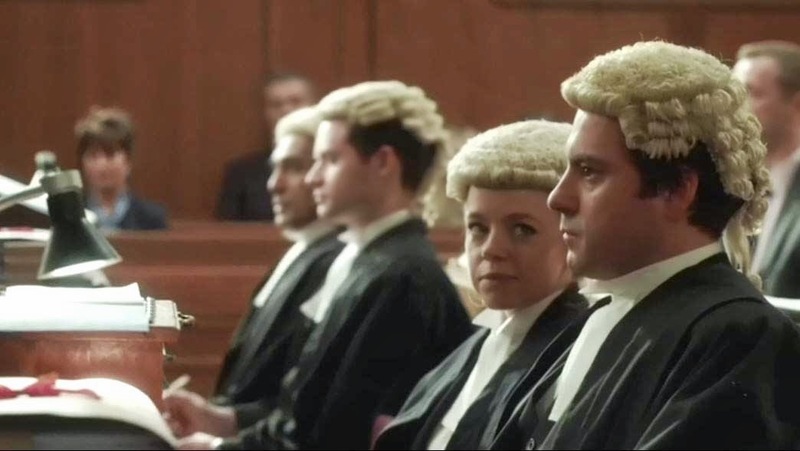 Cecile begs them so she can send her family money, and when Jake says it is beyond his power, the brief says Jake should talk to someone whose power it is or Cecile leaves as planned and they find themselves another witness. Jake tersely tells him not to play games with him. Back at Crown V Moran, Cecile testifies about Connie and how she got fired. Cecile did not call the police as she had no visa and was afraid Connie would tell the authorities. She went back to the flat but Connie would not let her in. She still had Jenny’s glasses but she could not give them back to her as Connie would not let her in. Connie took the glasses and said her grandmother was asleep and not to be disturbed. Vijay questions Cecile if anyone else was there to hear this, and Cecile admits they were alone. Vijay brings up the carriage clock and Cecile says it was a present and the police let them go. He mentions she has no valid visa and was due to be deported yesterday and says in return for uncorroborated and fictitious evidence – Jake calls to the judge – Vijay goes on to say Jake made sure she stayed in the country. Jake calls again to the judge but Vijay is done with questioning. Jake counters to ask Cecile if he or anyone else at CPS tell her or put pressure on her to alter her evidence, and Cecile says no. He also asks Cecile where will she be tomorrow, and she explains she is being deported. Vijay looks less than thrilled. Aftewards, outside the courthouse, Jake tells Kate that some of Vijay’s punches landed but they are still standing. She reminds them they have Connie tomorrow but Jake insists he is ready. Kate brings up the fact that sometimes illegal immigrants sometimes go years without being found out and how come the Border Agency found Cecile so quickly? 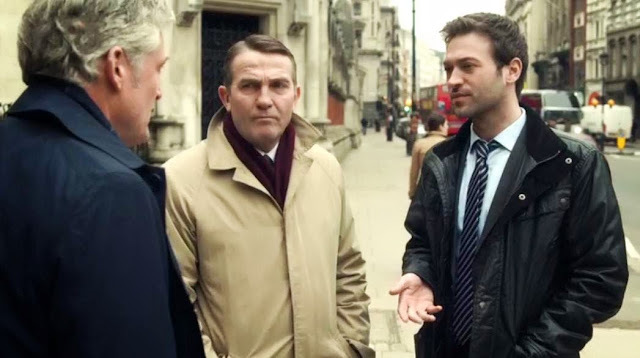 At the UK Border Agency, Ronnie and Sam speak with the administrator who tells them Cecile was on their watch list but low priority. They got an anonymous tip off. Sam asks when the call was made. Back at Crown V Moran, Connie is testifying that she lied to the police because she was ashamed that she was there and did not do anything. She admits she borrowed against the flat as the company was going under and she could help, admitting in hindsight it looks bad but she loved her grandmother and would not do anything to hurt her. Jake cross examines and Connie has to admit that she did not tell her grandmother about the creditors. Jake says she was desperate but Connie says she didn’t want to concern Jenny. Kate races into the courtroom and gives Jake some paperwork. Jake brings up Connie firing Cecile and Connie says Cecile just did not understand Jenny’s diet. Jake brings up that she lied to the police about firing Cecile, and Connie says she was trying to protect her and she didn’t want the police going after her. Jake states that Connie lied about Cecile and about the last time she saw her grandmother, and she must be ashamed about quite a lot. Vijay stand up and addresses the judge, saying this sounds like a speech. The judge tells Jake to ask a question or sit down. Jake asks what about the other lie, about telling the police she did not know where Cecile lived, yet earlier that day, the UK Border Agency got an anonymous phone call giving them Cecile’s address so she could be deported, and asks if Connie made that call. Vijay says this is the first he’s heard about this, and Jake says the information only came to light today, and submits to evidence phone records showing that Connie made that call. Connie then admits she did make that call, she was afraid she would tell the truth – that Jenny killed herself. Connie said Jenny knew what she was doing, she was ill and in pain and she had made up her mind. Jake questions that they are asking them to believe her mother starved herself to death, and Connie says he is not a Catholic, he does not understand. Jake says he understands perfectly well, but Connie goes on to explain Jenny, as a Catholic, could not commit suicide and at least this way it was not a sin, it was God’s will. She would not have been able to be buried next to Connie’s father, not in consecrated ground. Cecile is also a Catholic and did not want Cecile to confess. Jake retorts that Connie is put on trial for murder and suddenly she recalls it was suicide. Connie says it is the truth, and Jake counters that it is convenient. Jake begins to argue and Connie says suicide is a mortal sin, and Jake shouts it was murder. Connie shakes her head and insists all she did was watch, she knew what gran had done and she lied about it – that’s her sin. She can be forgiven for lying; suicide is the sin with no forgiveness. Later, Jake makes is closing statement and says Vijay’s case is on smoke and mirrors and suddenly they hear it is a suicide, one that is shrouded in talk of mortal sin and internal damnation, and it is all there to get them to take the eye off the ball, something they must not do. Jake makes the case that Jenny’s death was Connie’s way out, so she deliberately isolated her grandmother, no doctors, and systematically reduced Jenny’s food and drink and when she was dead – when the plan had worked – she shed crocodile tears, quietly called the Border Agency to report the only witness to the crime and then went down to the bank and cashed in. He outlines Jenny’s horrible death, saying it wasn’t God’s will that Jenny starved to death, it was Connie’s. Vijay makes his closing argument, look towards Jake and saying sometimes they use smoke, mirrors, and rabbits out of the hate when there is nothing in their armory. But not this time. The simple fact that the prosecution had misdirection of their own – they did not mention reasonable doubt. There was no witness unable to say under oath beyond reasonable doubt that Jenny starved to death. It cannot be proved that Connie caused the death of her grandmother. Vijay says murder is when a person of sound mind unlawfully kills with intent. If they have no doubt that Connie did all the things the prosecution allege and so doing caused the death of her grandmother they must find her guilty. But if they have any doubt at all, then it is equally their duty to return the only verdict possible – no smoke, no mirrors – no guilty. Later, the jury declares Connie not guilty of murder. Connie is relieved as is her mother in law. Vijay smiles and looks over to Jake and Jake, and Jake stares straight ahead with no emotion. 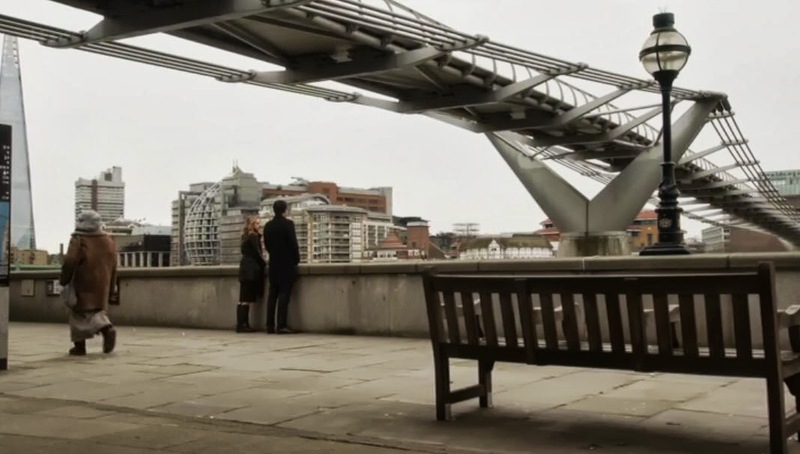 Afterwards, Jake is standing by the bank of the Thames and Kate walks up to him, telling him he missed a meeting and she made his excuses. She adds the next time he goes for walking she is going to tie his shoelaces together. Jake smiles. Jake gets a serious look and tells Kate she was right, he can’t make up for his mother by punishing Connie Moran. Kate apologizes, saying it was none of her business. Jake wonders what it cost Connie to stand by and watch, to actually make it possible for Jenny to kill herself because that is what Jenny wanted. Connie had a duty of care, and wonders if Jenny would say Connie fulfilled it? Jake says he couldn’t even hold his mother’s hand. Afterwards, Connie was willing to go down for murder rather than betray her grandmother’s wishes. Jake thinks Connie was a better granddaughter after Jenny died than he was a son when his mother was alive. Kate replies assuming the jury got it right. Jake says they did, and when Kate asks if he is sure about that, Jake says that like Connie said, if you are not a Catholic, you can’t understand. He adds that mortal sin kills the life of grace within us. 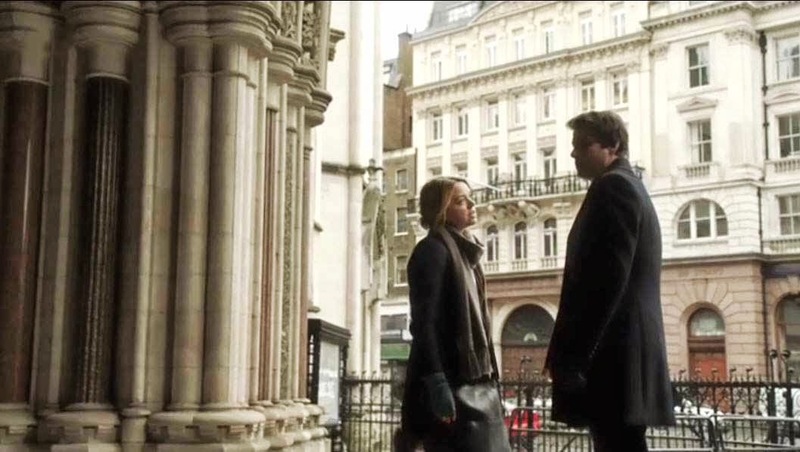 He smiles at Kate and as he begins to walk off, she asks if he is going back to the office. He says he just needs to clear his head, but thanks for…bothering. She watches him walk away alone. 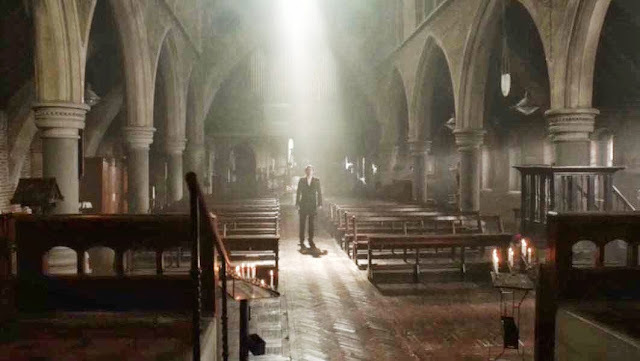 Later, Jake is standing in an empty church and looks up toward the light streaming through the windows. Then, the priest opens the confessional window opens, and Jake is seated on the other side, and he says, “Forgive me father, for I have sinned.” He looks down sadly as we cut to black.